Engaged in manufacture and export of an excellent range of Oscillators & Wave Shaping Circuit manufactured using quality raw material. Dedicated trainer board for each wave shaping circuit. Completely self - contained stand - alone unit. Construction and study of a voltage controlled oscillator. Study the effect of varying voltage on the output frequency. Determination of the frequency of oscillation using the formula. Verification of observation and calculate frequency. Test points provided at various stages in the circuit. Strongly supported by a comprehensive instruction manual complete with theory and operating details. 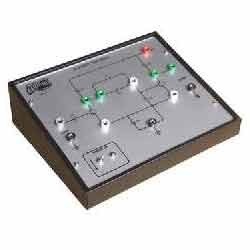 Built - in DC regulated power supply with short circuit protection and LED indication for supply “ON” to works on 230V AC Mains. 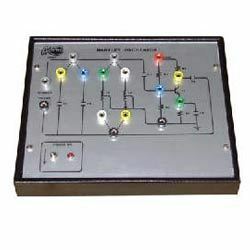 Keeping the track of latest happening in this domain, we manufacture and supply Hartleys Oscillator Trainer Board. 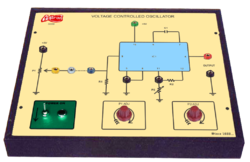 For the purpose of studying and demonstrating the working of hartley oscillator, the offered trainer board is used in colleges. 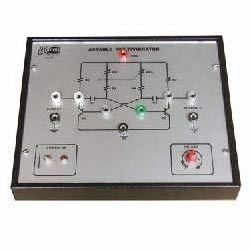 Our engineers make use of latest machinery, for manufacturing the offered trainer board as per the industry laid norms. Construction and study of hartley oscillator which contains a tuned l-c circuit with transistor. Study the change in output frequency by changing l-c combinations, by varying shunt capacitance “c” and /or varying inductance l.
Verification of observation and calculated frequency. Built-in dc regulated power supply with short circuit protection and led indication for supply “on” to works on 230v ac mains. Construction and study of a stable (free running) transistorised multivibrator. Study the generation of rectangular wave. Study of the change in time period with the help of a built-in ganged potentiometer. Test points at various stages in the circuit to observe the waveforms and voltages. Demonstrates the principle, working and comparison of various clipping and clamping using diodes. built-in bank of resistors, capacitors and diodes. 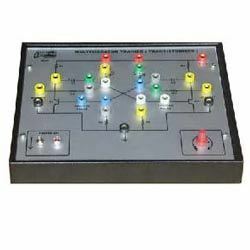 multi-coloured test points are provided at various stages in the circuit to observe the waveforms and voltages. Construction & study of (free running) transistorized multivibrators, stable multivibrator. Each multivibrator is made using jumper links. Study of the change in time period with the help of a built-in ganged potentiometer for each multivibrator. Calculate the output frequency for stable multivibrator. Construction and study of a Transistorized Schmitt trigger. Study the effect of change in amplitude of input sine wave on the rectangular wave output (effect on amplitude, width, etc). To observe the UTP and LTP. 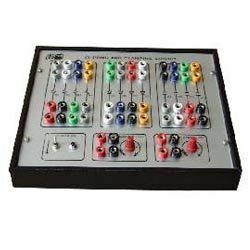 Looking for Oscillators & Wave Shaping Circuits ?